Having a front yard is one of the reasons why you should consider finding the best brush cutter. You will not be able to deny that it is often filled with overgrown shrubs, especially if you do not have someone to keep the ground maintained. Take note that it is not all about the weeds, but is also about large-sized rocks that make it harder to keep the landscape clear. What you need in this situation is a brush cutter. This is a weed wacker that comes in a handheld version. You can use the tool to eliminate unwanted weeds despite the obstacles around. However, the selection of the right product to purchase is still complicated. You have to learn how to evaluate options cleverly. To help you, read on and know more about the basics. This brush cutter became one of the best due to its top-of-the-line functionality. It is one of the few that provides the advantage of a quick start. Apart from its JumpStart technology, this equipment is powered by gas, ensuring reliability and better performance than its counterparts. 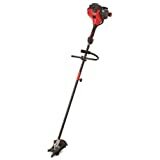 The Troy-Bilt TB42 BC 27cc 2-Cycle Gas Brush Cutter is an excellent choice if your regular trimmer is no longer carrying out its task properly. It can get rid of dense brush and weeds. If you have tough succulents around, this is an excellent cleaning buddy with highly durable components. Among the high-quality parts of the brush cutter are its gearbox, engine, steel-tip blade, and steel boom. When working in unison, you can anticipate the components to support your activities in the long run. As guaranteed, its crankshaft is designed to reduce vibration and promote longevity. The coupler available with the Troy-Bilt TB42 BC 27cc 2-Cycle Gas Brush Cutter provides you the freedom to link either an edger or saw. Its engine will still power it up. Nonetheless, these attachments are sold separately. You no longer have to use a pull cord with this engine. Even the pulling of the cable is much easier with the aid of SpringAssist feature. Since the shaft design of the tool is straight, it will be more manageable to handle hard-to-reach bushes and shrubs around the garden. This brush cutter is described as a flexible model coming from a well-known company –Husqvarna. It is made available to support different tasks at your yard. Apart from clearing the tough weeds around, you can also rely on it for light edging. Among the most notable features of the Husqvarna 223R Brush Cutter is its SmartStart technology. It recoils easily, giving you no worries about storing it properly. Furthermore, it comes with an air purge pump. Also, grass blades and trimmer heads both work for the tool. This can be proven by its combi guard and sloped handle bar. Its automatic trimmer head is easy to attach. For further safety, it has a dual harness. This will provide you more control over the equipment regardless of trimming almost the whole day. When the tool is switched off, the auto return stop switch will be brought back to its primary position. This gives way to an easier start-up. It is also capable of eliminating the air from the fuel system and carburetor. This contributes to the natural start-up feature of the tool. The Husqvarna 223R Brush Cutter comes with a grass bevel gear. This is constructed to provide increased torque when working on your lawn. You will achieve an efficient cutting result since the tool remains parallel to the ground. Once purchased, it will come with a string head that is loaded beforehand. The assembly is easy, and you will have no issues with its configuration. Gas brush cutter, Comes with double harness, grass blade and easy to load semi automatic trimmer head. You can also consider this brush cutter given it comes with the durability guarantee. It has a blade made of carbon steel with a length of 16 inches. This will allow you to reach even the dense areas to cut through brushes or weeds completely. The AMES True Temper 16-Inch Weed & Brush Cutter is also designed with the blade having double edges. With this component, you will be able to carry out swings and forward cuts efficiently. Paired with this robust blade is a hardwood handle for support. This brush cutter is also constructed with an eye hole, which allows easy storage. You can save space in your garage since it can be hung. You can rely on this tool if you want the quickest way of clearing away unwanted weed growth in your garden. Using the AMES True Temper 16-Inch Weed & Brush Cutter is very simple. You just have to swing it forward and backward. Apart from the weeds, you will be able to get rid of the debris as well. Since the material is sturdy, you do not have to worry about new replacement of the tool. Even if you use it for years, its quality will remain good. The tool has a momentum that will carry out the actual cutting. Regardless of not applying too much force, the tool will effortlessly get rid of the small vines, first-year sapling, and knee-high weeds around. This brush cutter is highly considerable since it comes from one of the world renowned companies worldwide – Hitachi. The manufacturer is considered among the ideal providers of brush cutter engines. In this product, you will get a combination of brush cutter and string trimmer. Given that the Hitachi CG22EAP2SL Brush Cutter is a two-in-one product, you will not only save money but also attain convenience in working with your lawn. The tool is powered by a two-stroke engine, which has met the standards for safe emission level. When it comes to power, it will not fall short. Take note that it is even lighter than its counterparts at just 11 pounds. Most users will find it highly portable. Regardless of this, you will be surprised that its components are made of durable materials, such as steel. Its drive shaft is made of solid steel, implying that you will be able to depend on the Hitachi CG22EAP2SL Brush Cutter for years to come. Additionally, it has a vibration-reducing system to eliminate the fatigue on your arms and hands after a day of trimming. Similar to the previous products featured in this review, it provides an easy start-up advantage. You no longer have to exert much effort in pulling the cord to utilize the equipment. The package is also available with a semi-automatic trimmer head. The said component can hold 0.095 inches of copolymer trimmer line with a 13-foot length. You will find this brush cutter a convenient choice. In a package, you will not just get two tools, but six. Apart from the trimmer, the Poulan Pro PP325 Brush Cutter is available with a cultivator, edger, pole pruner, brush cutter, and blower. It is designed for multiple attachments under the Quick Connect feature. By taking advantage of it, you will be able to switch from one tool to another. The engine powering it up is a 25cc two-stroke gas system. Paired with the mechanism is a dura chrome cylinder for longevity. Among the most notable features of the Poulan Pro PP325 Brush Cutter is its natural start-up feature called the SureFire system. Instead of pulling the cord with much force and repeatedly, it will begin operating without the hassle. Apart from using it in your yard, you may also utilize it for commercial activities. It can eliminate tall and tough grass and weeds. The Poulan Pro PP325 Brush Cutter also has a grass blade with a size of eight inches. Alternatively, there is a binary line attachment with a length of 17 inches. 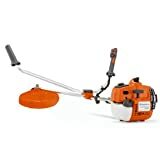 Since it has a pair of line cutting head under the Tap N Go feature, you will not have issues with the instant trimming of your lawn. As a recommendation, you use a synthetic two-stroke oil for the engine, which is obtainable in various stores. Before checking out brush cutter reviews based on their brand, you should consider the different kinds of the product. You cannot only settle for the recommendations of your peers. It is always necessary to take regard of your preferences. For every type of brush cutter, there is a similar purpose. Furthermore, there is also a set of advantages and disadvantages you should keep in mind. Once you have selected a brush cutter type, you will be able to eliminate other products from your choices. To give you insights on this subject, here are the following types of brush cutters. 1) Bicycle Handle Brush Cutter – This is the kind of brush cutter that is often selected by people. It usually comes in large sizes. If you want to deal with little weeds in a grass lawn, this is a good choice. You could rely on this if you have a considerably low property. Nonetheless, this is not the suggested option by professionals if your garden or yard has some obstacles. You will notice that bicycle handle brush cutter does not have an immediate reaction control. Also, controlling the equipment to work vertically is more complex. In addition, if you are on a steep bank, it will be risky for the user. 2) Loop Handle Brush Cutter – You can depend on this type of brush cutter if you handle slopes and areas that are way too steep. It is also reliable if you will get rid of tough weeds. Even if there are obstacles present, you will find this model easier to manage. However, there are also disadvantages with the use of this brush cutter. Primarily, it brings vibrations to your hands, which will somehow cause fatigue when used continuously. Also, it may cause back pain if you do not use your hands when working on big lawns. 3) Back Pack Brush Cutter – This brush cutter can be relied on if you want to cover big-scale lawns for a shorter period. It distributes the load properly on your shoulders, giving you no worries about ache at the end of the day. This is not the best option if you will work on steep slopes as it may cause loss of balance. Users will find it difficult to avoid falling since the weight is on your back. There is even a possibility of the blade coming in contact with your body. If you are confused on how to purchase a hand-held brush cutter, you should create a checklist of factors to consider. Be reminded that you should not only concentrate on the brand of the product but its overall functionality. You should ensure not to end up with a choice that will result in immediate replacement in the future. Always search for a product that will not only save you money but comply with your needs. To begin your selection, given below are the specifications, you should concentrate on. 1) Power – Brush cutters can be fueled by a stroke gasoline engine, wire, or a battery. By evaluation, you can consider electric-powered options less powerful than its counterparts. Nonetheless, these are quiet and lightweight. You can also operate it smoothly. You can consider gas-powered brush cutters naturally more powerful of the two. Despite this, expect that its operation is noisy. Furthermore, it can be heavier. You also need to have constant access to gasoline to utilize the equipment. 2) Shaft – It is best to find a cutting head driver in steel construction. This component can either be bent or straight. The former allows you to get closer to the object you will work on. Detailed work is best carried out using it. However, there are similar mechanical issues with it. 3) Cutting Head – As much as possible, you should not select a quick-change cutting head. It is still ideal to find one that requires you to disassemble the equipment itself. Usually, rapid changing heads cannot guarantee reliability or better performance. 4) Handles – You can select from two or one-handed brush cutter. The former is the ideal selection if you are working on a big project. Alternatively, the latter is best if you want to achieve convenience when using the tool. 5) Vibration Control – High-quality brush cutters available today have the capability to get rid of the undesirable vibrations during operation. 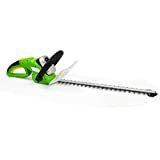 Given you have found the best brush cutter for the money and functionality, you should also the spare time in learning how to use it properly. Similar to other gardening tools, the maintenance of brush cutter depends on its correct application. At times, it is not enough to read the instructions included in the device alone. You should also give way to what the experts and experienced gardeners have to say. To give you a good start in using the equipment, here are the guidelines. 1) Always Wear Safety Gear – When working with a brush cutter, do not forget to dress properly for safety. The best option you have a loose clothing. If you work until the sun is down, consider donning a brightly colored dress. This will make you more visible. It is also imperative to pair your clothing with closed shoes, safety glasses, ear protection, and gloves. 2) Choose a Good Location – You must select a place that has good ventilation. As much as possible, you should not operate the equipment indoors, which will cause you to inhale toxic fumes from the brush cutter. 3) Check Obstacles First – Instead of using the brush cutter right away, you should test the area first. Remove trash, rocks or stumps present on the lawn. It is also a very good idea to mark those objects, especially if they cannot be deleted by hand. Before working, ensure that there are no valuables, people, or pets at a proximity to the area. 4) Verify the Cutting Height – Utilize a higher cut for the first time. Afterward, you can reduce the cutting height to achieve fineness. 5) Use the Harness – If you work with blades, take advantage of the harness to make the handling of the equipment much easier even for long periods. You are not prohibited from purchasing standard brush cutters. However, for the utmost convenience, it is best to select the Hitachi CG22EAP2SL Brush Cutter. The product will allow you to connect attachments instead of just a cutter. It is also unexpected for a two-stroke engine to have a noiseless operation. From the start-up to the operation, the product works seamlessly. Regarding price point, you will never go wrong as well.